We will be updating the list of our 2019 sponsors periodically! 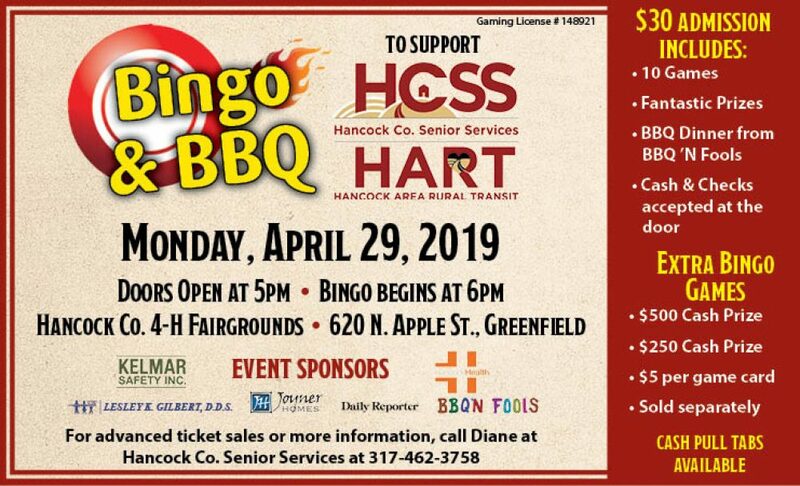 H. J. Spier, Co. Inc.
Georgia Knotek, D. D. S.
We would love for you to be one of our Bingo Sponsors. Click here for more information! Hancock County Senior Services, is a community-based, not-for-profit agency serving the elderly and disabled in Hancock County of Indiana. Established in 1978, the agency assisted 1,049 residents in 2018 through one or more programs. Growing older holds new promises and opportunities that just were not found in other generations. Today, special services and programs are available for older adults helping them maintain their personal pride, self-worth, and independence. Look for additional programs and services to be announced throughout 2019! Hancock County Senior Services, Inc., is an equal employment opportunity employer.